Q: Is the British BBFC 15 Version uncensored? 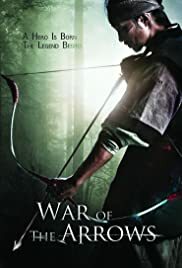 War of the Arrows is not your typical action film. Certainly, much about it is typical. The lone hero, avenging his nation which has been taken over by some other hostile nation, sets out on a journey to rescue his kidnapped sister. In the process, he becomes a hero of the people. Yes, we've seen this before. But where this film truly shines is in it's inspired choice of focus: that of the bow and arrow. This is particularly interesting because archery is something that takes great skill. So, seeing an action film that takes on this weapon as focus is interesting in and of itself. But the film actually succeeds where it might otherwise fail. As stated before, the film is fairly typical. 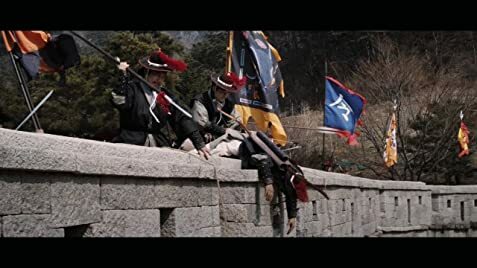 It takes place during the Second Invasion of Manchu, when China invaded Korea in the early 1600's. The focus is on Nam-Yi, a skilled archer who, along with his sister Ja-In, must flee to a friend of their father's when he is killed. We spend a good deal of time in the beginning of the film seeing these two characters as children and then when they are young adults, but it's mostly somewhat interesting drama that does a decent job of setting up the story. The real meat of the film kicks off in the second hour when Ja-In is kidnapped and Nam-Yi must go after her. Once this part of the story gets underway, the action gets underway with it, and it's pretty damn impressive. The choreography and cinematography following the battles between arrow slinging warriors is fantastic. There were moments when I had to rewind and play the scene again just to get a second look. This isn't out of poor filmmaking, but because some of the scenes are so damn cool, you want to see them again. And luckily, these scenes are rapid fire and a plenty. From the chases through the woods to a ravine shoot out to the final stand off, you barely have a moment to catch your breath. Although you realize that these men aren't actually as skilled as they come off, there are moments when you're none the less amazed at what's being shown. Of course, this action would mean nothing if it weren't surrounded by at least competent filmmaking, but there is great skill displayed here. Our actors never feel unnatural, even if the acting isn't to rave about, and the cinematography is fantastic. This film would not work at all if the camera work was shotty, and thankfully it's not. You can savor each moment of fantastic action in calculated, collected shots that take the time to slow down when necessary and catch you by surprise when necessary. Suffice to say, all of this creates one fantastic action film, one of the best I have seen from Asia in quite some time. If you're a fan of Asian action films, you owe it to yourself to give War of the Arrows a try. It's completely worth the time, even running over two hours. You won't be disappointed.